One of the greatest scourges facing our society is overpopulation especially in densified urban centres and the associated ability of service infrastructure to meet the growing over-demand for capacity. Sewerage is one of those critical service issues, and to add to the sewage system overload, is the grave risk that high demand and incapacity place on the environment and to human health with leaks and spills. In addition, aging infrastructure does not hold well when literally weighed down. The population explosions that have happened and urban influx were never anticipated at such an exponential growth rate when the original city infrastructure was planned and designed. An overburdened sewage system will undoubtedly collapse under the strain. Once this happens, untold health and ecological contamination ensues, affecting surface and groundwater resources, essentially our drinking water supplies. The citizens of Connecticut, USA, led an unremitting campaign to get its House to pass a progressive law on the 'Right to Know' about sewage spills and leaks. The bill is a proactive means to issue warnings to the public related to any sewage health risks and will enable citizens to proactively avoid all high risk water bodies. According to the US EPA, up to 3.5 million people fall ill from swimming in waters contaminated by sewer overflows alone every year. Besides the chemical toxins and wastewater found in sewage; dangerous life-threatening micro-life abound in our flows. These pathogens are deadly parasites, bacteria and viruses and enter our oceans-beaches and recreational inland water bodies. A release of highly toxic chemical and biological contents into the environment can create health epidemics such as cholera. Some of the lethal health impacts caused by these micro-organisms are diarrhoea, stomach cramps, fevers, skin fungi, worms, hepatitis, symptoms may be either acute (short-term) or chronic (long-term). The longer lasting effects may even lead to complete immune collapse in predisposed individuals already weakened by other immune-diseases such as HIV/AIDS. It would seem that the population groups more prone to the susceptibility of the pathogens are younger children and the elderly. Pathogens can enter the body through different pathways, the most obvious skin contact, but also through nose, mouth, inhalation, drinking contaminated water, hand-to-mouth and open wounds. Cholera epidemics have been reported throughout the globe, hotspots being areas of poverty, lack of water supply and sanitation. Not forgetting during natural disasters, pathogens also thrive. Vibrio Cholerae, the cholera-causing bacterium, which is a "bacterial infection which is contracted by drinking contaminated water or by eating food which has been in contact with contaminated water, flies or soiled hands. The germs which cause cholera can be found in the stools of human beings (KZN DoH, 2001)." E.coli, another one of the scaries, knows not class and no matter where a sewage leak arises, the risk of disease awaits. Like most pathogens, over time they become resistant to human antibiotics and are able to proliferate. One such stubborn bacteria, is Escherichia coli/ E.coli, resistant to most antibiotics. The most common pathway is through ingesting contaminated food through faeces passed onto the food. E.coli is highly contagious, spread by touch, causing severe abdominal cramps, blood in stools, fatigue and vomiting just to name a few symptoms. 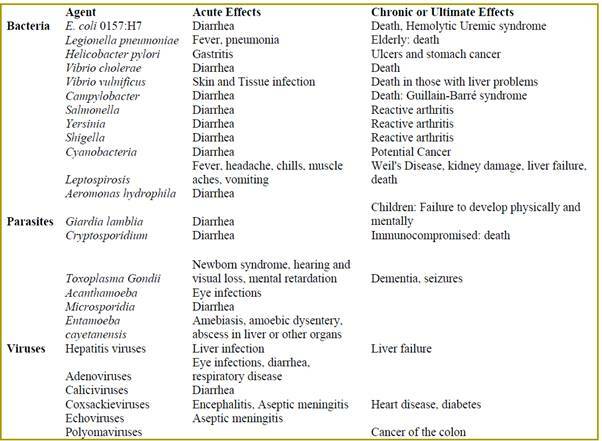 The figure below provides a break-down of the pathogens and their effects on the human body. Another scary pathogen is the Necrotising fastitis, it destroys skin, tissue and fat layers within a short period. It's earned the name 'flesh-eating bacteria' due to its rapid disintegration of skin and tissue. In KwaZulu-Natal, a victim was swimming in the lagoon on the south coast, injuring his foot on the rocks, he didn't realise the horror he was facing. He experienced unusual pain in the affected area and the next day rushed himself to a doctor only to discover he had contracted the deadly bacteria in the water that had entered through the small open wounds. It resulted in his limb being amputated to rid his body of the rapid infection. The victim, RW Johnston (2009), said: "Almost certainly the reason the lagoon was polluted with such a deadly organism was to do with the dumping of raw sewage by communities living upriver". Untreated raw sewage also contains high levels of nutrients (namely from pesticides and chemicals) leading to algal blooms, some of which are toxic to humans and can be passed on in the food chain through shellfish consumption or recreational swimming. Symptoms include abdominal pain, vomiting, diarrhoea, liver failure, and etcetera. Besides the human health impacts, raw sewage leaking into the environmental decimates other life-forms, destroying food sources and places for habitation. Not only does sewage reek, it is dangerous in that passing through the system is not only organically producing decomposition gas, but household and industrial wastewater chemicals. Sewer gases may contain a range of gases from ammonia, methane, carbon dioxide; hydrogen sulphide (rotten egg smell), illegal hazardous discharges of fuels and other chemicals, all contribute to the odours, explosion risks and health risks. Spillages of sewage infiltrate soil surfaces and subsoil layers, penetrating to groundwater. Whilst water is a survival resource, so is soil, we need healthy soil to grow health food. One of the medium pathways is from soil to crops to human food consumption level. Use only clean, treated or boiled water (government also advises on the use of a chlorine bleach proportion added to water to kill of germs). Always clean any surface that has come in contact with raw meat, before any other item is placed on that surface. Always thoroughly wash your hands after handling raw meat, and before you handle any other utensils or other food items. Never use the same plate, tray or utensils for the cooked meat that you use for the raw meat - unless you thoroughly wash the plate, tray or utensils in-between. Always cook meat, especially ground meat, until the juices run absolutely clear - pink is not good enough. In fact, it is necessary for the internal temperature of a hamburger pattie to reach 160 degrees F to kill all of any contaminating E. coli. In day-care centers, schools, etc., any small children with diarrhea should be carefully handled, and kept separate from all well children. All diapers, and any soiled clothing should be kept separate from all well children. The day-care worker, teacher, and health-care personnel should practice strict hygeine at all times, regardless of the health of the children. The advances made by Connecticut should be a precedence-setting globally where all local governments enact similar legislation not only making the public aware (often people flush all sorts of nasties that clog up the system too) but also creating watch-dog citizens who are able to aid the government in monitoring and addressing these infrastructural failures. Certainly no government wants the disaster management costs and health epidemics that are created from raw sewage into the environment.